Impress your clients with a variety of delicious, high-quality food that is professionally presented by our catering experts. Enjoy the convenience of ordering online or by phone. When you order online, you’ll earn Deli Dollars that can be redeemed toward future online orders. Feeding large groups on short notice is our specialty. We offer same-day delivery, seven days a week, usually within the hour. No 24-hour notice required. 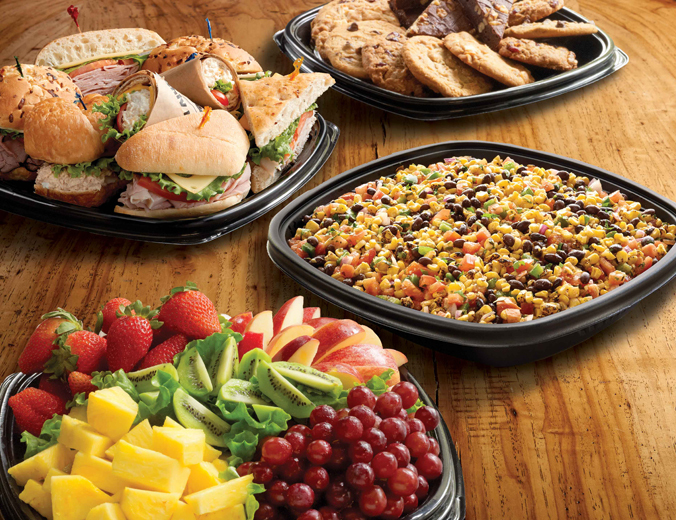 We begin delivery as early as 6 a.m.
For ultimate convenience, we offer a variety of easy-to-order meeting packages. Just let us know how many servings you need, and we’ll figure out the rest. Each deli has a catering team dedicated to serving you. We’ve streamlined the billing process by offering House Accounts for approved companies. You can even have your House Account linked to your online account to speed up the checkout process. In addition to our continental breakfast items, we offer hot breakfast sandwiches for early morning meetings. We offer vegetarian and gluten-sensitive menus. You might know us for our great sandwiches. But we offer so much more, including pastas, salads, potatoes, soups, fruit trays, veggie trays and desserts. Even our sandwiches aren’t just sandwiches. With a dozen types of bread to choose from and countless fixings, you can be sure that your group is satisfied. Our meats and cheeses are sliced fresh daily in our delis. We have 25 recipes made from scratch daily on site. Our produce is delivered fresh to each deli six days a week. Our ingredients are sourced and hand-chosen by our in-house food buyers.